Beautiful renovated farmhouse with large barn located in the village center of Nieuw-Beijerland. Located in the heart of the Hoekse Waard with restaurants, hotel, supermarket and schools within walking distance. With the ferry and the metro from Spijkenisse you can reach Rotterdam in 30 minutes, but you can also reach Rotterdam by car in 30 minutes (via A29). In Oud-Beijerland you are in 10 minutes by car and Amsterdam-Schiphol can be reached within one hour. The farmhouse (former barn) dates from the year 1910 and the plot including the adjoining barn and beautifully landscaped garden on the south is approximately 1.262 m². In 2003/2004 the farmhouse was lovingly renovated by RoosRos Architects in the beautiful state in which it is now. The residential farm was also made sustainable with solar panels and double glazing. The farmhouse is authentic with old details, beautiful large and high rooms and beautiful robust and atmospheric materials have been used. The old beams are still original. For example, office / practice can be held at home and there is also a separate guest house / studio in the residential farm *. The total gross content of the farmhouse is almost 3,000 m³! 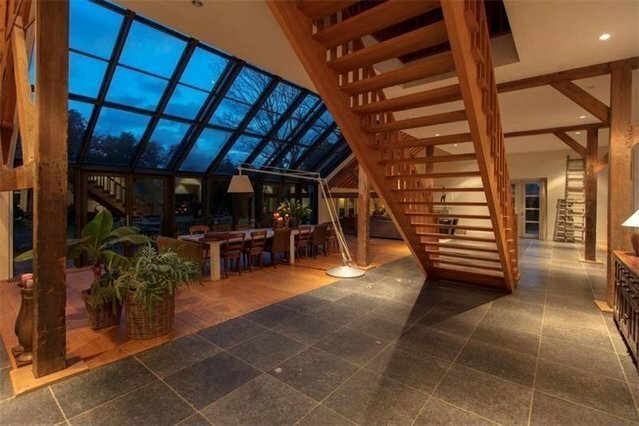 You must have seen this farmhouse to experience the beauty of it. Nice high hall with toilet and floor of honed Belgian stone and access to the living room, TV room, practice room / office and utility room. The entire ground floor has underfloor heating. Extremely spacious and cozy living room with several doors to the garden and equipped with a floor with partially solid oak planks and large tiles of honed Belgian stone. From the living room you have a beautiful view of the garden through the glass front (up to the ceiling). In the middle of the living room is the spacious solid oak wooden staircase to the first floor and in the back of the living room there is a separate sitting and TV corner. There is also a play area at the back, where there is currently a professional pool table. Second living room with large fireplace. Open kitchen of the brand Bulthaupt with various appliances and an American fridge. Utility room with laundry room and door to the garden. Large practice space / office at the front of the farmhouse with view on the street. Where two bedrooms have a staircase to higher part / level with open storage space. Second bathroom with bath and sink. With several terraces and sunny garden under construction.